Today, I published a new pattern and it is available for purchase in my Ravelry shop. The Coup de Coeur Cowl is a stranded colorwork cowl knit in super bulky/chunky yarn. This very quick knit has a whimsy and practicality. The Coup de Coeur Cowl loves long walks on the beach in the wintertime, ice cream cones on chilly Autumn afternoons, and making sure your neck doesn’t have to brave the elements. Knit and Purl; Knit In The Round; Beginner Fair Isle Skills. Tapestry needle to weave in ends. 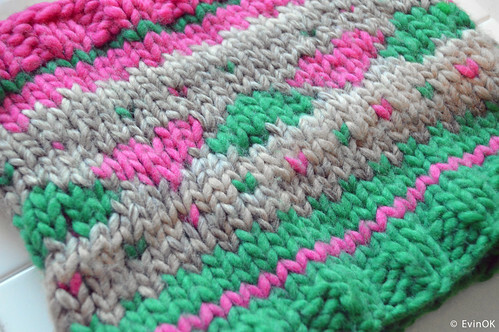 Gauge is not essential for size, only for visibility of colorwork so it is not specified in the written pattern. 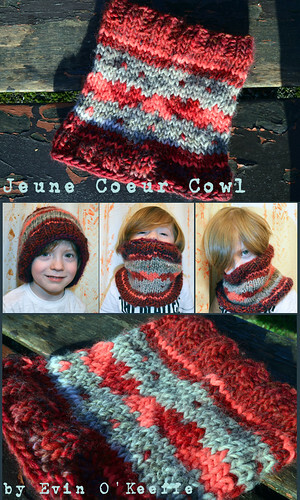 For the child-sized version of this pattern (with different sizing and chart design), check out the Jeune Coeur Cowl pattern. 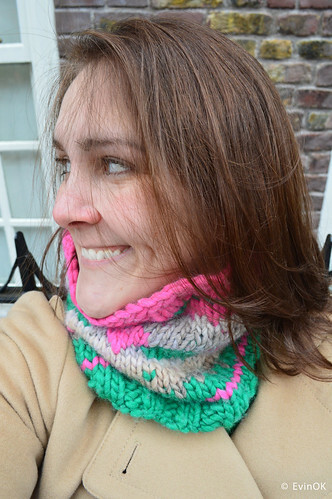 This entry was posted in Knit Scarves & Cowls, My Knit Patterns, Tutorials | Patterns, Win | Giveaway and tagged ravelry.